The U.S. EPA is significantly underestimating biodiesel's capacity to deliver more advanced biofuel to U.S. consumers in the coming years, the National Biodiesel Board said in public comments on a pending renewable fuels proposal. Pacific Biodiesel President Robert King attended in early July the formal signing of the Renewable Fuels Production Tax Credit by Hawaii Gov. David Ige, a long-awaited incentive for biofuels producers in the state. The credit takes effect in 2017. California Air Resources Board released a set of carbon intensity (CI) pathways June 30 for biodiesel and renewable diesel pathways certified under the readopted low carbon fuel standard (LCFS) regulation using the CA-GREET 2.0 model. 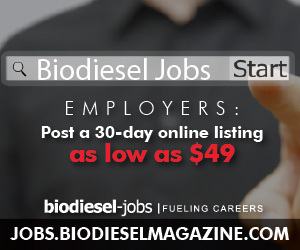 A 50/50 joint venture between Biox Corp. and World Energy announced June 30 that it has closed on the acquisition of a 90 MMgy biodiesel production facility in Houston, Texas, formerly known as Green Earth Fuels. Start-up will occur in Q3. The Brazilian Biodiesel and Biojetfuel Union (Ubrabio) and the Roundtable on Sustainable Biomaterials have joined forces in discussions and decision-making processes to promote sustainability in Brazil's biofuels and biomaterials production chain. Pacific Biodiesel rolled back the retail price of its Maui pump station biodiesel July 1 by 9 cents per gallon, the amount of the on-road biodiesel fuel tax exempted by Maui County in its fiscal year 2017 budget, which also took effect July 1. Davanzo and Fedyna operated entities that purported to purchase biodiesel, on which credits had been claimed and which was ineligible for additional credits, produced by co-conspirators at Gen-X Energy Group and Southern Resources and Commodities. The comment period for U.S. EPA's proposed rule to set 2017 renewable volume obligations (RVOs) under the renewable fuel standard (RFS), along with 2018 RVOs for biomass-based diesel, closes July 11. More than 6,000 comments have been filed so far. Carlsbad, California, is now fueling its city diesel fleet with Propel Diesel HPR (High Performance Diesel), a fuel produced by Neste and specially formulated and distributed by Propel Fuels that consists of 98.5 percent renewable diesel. Amerigreen Energy and its 100 percent American fuel dealers hosted a video essay challenge as a way for students to express their thoughts on energy solutions for the future. The contest was open to students in grades 1-12, as well as undergraduates. The National Biodiesel Foundation elected Lindsay Fitzgerald of Renewable Energy Group Inc. to its executive committee during the June board meeting in Washington, D.C. The NBF advances initiatives that are important to the biodiesel industry.